Ever painted on the South Coast? Robert Abele III says the light there is matched only by that in Venice, Italy. Lead Image: “Adamsville General Store,” by Robert Abele III, 2014, oil, 16 x 20 in. 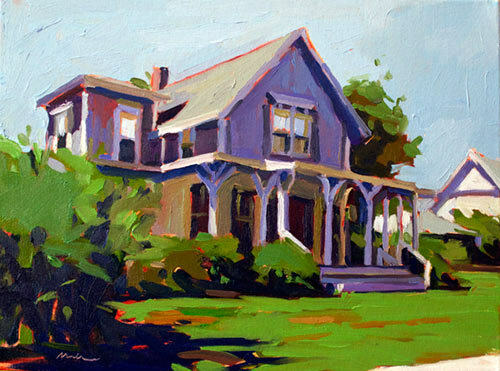 “Nonquitt Cottage,” by Robert Abele III, oil, 12 x 16 in. “Block Island Light,” by Robert Abele III, oil, 12 x 12 in. Abele has a 5-year-old son and a newborn, so time is an issue these days. “I do a lot of watercolors at the beach,” he says. “I don’t have much time to choose my subjects.” That will change now, with Labor Day past. The visitors to the Cape and surrounding areas will go home to New York and New Jersey, and Abele will lead plein air painting groups to areas kept more private and exclusive during the summer rush. Abele will be in a rush then — painting the light before winter brings with it an altogether different palette.